What Is the Settlement Value of Maryland Whiplash Claims? Because whiplash is a common injury in motor vehicle crashes, these injuries have been the subject of literally millions of injury claims. Victims have a lot of questions about how these claims proceed. But one question rises to the top: what is the settlement value of my whiplash injury case? This article discusses how these claims work and provides you with information about the settlement and trial value of these cases with example cases and average verdict statistics. If you have a whiplash injury, you most likely have a viable case in which you can get compensation. If you are a victim, you should research who you think would be the best lawyer for your case. This happens to an extent that is far more common than most people might think. Medical science is beginning to realize this. A new study in the journal Brain Injury, underscores the frequency with which brain injury can occur in whiplash injury car accident cases. The study looked at 1,200 MRIs in neck pain patients and found that those patients suffering from whiplash were more likely to have anatomical changes to the brain called Chiari malformation. In whiplash car injury victims, the bottom part of the brain dipped through an opening in the base of the skull after a whiplash injury, causing a brain injury in 23% of the whiplash cases studied. This translates to a lot more brain injuries from whiplash car accidents than even accident lawyers who are aggressively taking whiplash injury cases ever imagined. So few patients ever get a brain MRI that would uncover a Chiari malformation. There are also serious neck injuries that linger after whiplash accidents for reasons we just don't yet understand. For all that medical science has accomplished, doctors still don't understand enough about these injuries to the spine to understand exactly why some people have prolonged and permanent injuries from even relatively low-speed car accidents. In these type of case, our lawyers may accept the case if we have an "incredible plaintiff." These cases require two elements: (1) a permanent injury after a whiplash injury accident, and (2) a very compelling story with an incredibly strong and credible victim. The average verdict in "strains" the neck, back nationally measured over a seven-year period is $18,692. The median is $7,500 which means that the very good whiplash cases inflate the value. Obviously, this includes back injuries and not just neck injuries we think of when we think of whiplash. But they are largely comparable type injuries. If you are in Maryland, it is worth knowing the median auto accident verdict is around $12,000. Whiplash settlement awards are based on trial verdicts. We see how different cases play out at trial and then we try to project backward and extrapolate that similar cases have similar values. The weakness in this logic is that no two cases are the same. Keep in mind these verdicts can tell you something about the value of cases where the plaintiff prevails, but these results cannot alone predict the value of your case. The results of one case or even a few cases cannot accurately predict the value of another claim. April 2017, Maryland: $87,000 Verdict: Our client was a passenger in a taxicab in Baltimore County, which is supposed to be a very difficult jurisdiction to get a fair result in whiplash cases. This was a classic left turn case. The defendant simply took a left turn in front of the cab. There were no complaints of injury at the scene. Plaintiff later discovered her thumb was probably broken but the case was really about her whiplash injuries. The insurance company made no settlement offer on the case although they did ask before trial if we "would take $13,000 if it was offered." October 2014, Maryland: $18,750 Arbitration Award: A 30-year-old war veteran/nursing student is driving down Route 702, near its intersection with E. Homberg Avenue, in Baltimore County when a vehicle makes a left-hand turn in front of him. The vehicles collide at approximately 50 MPH and cause the victim’s car to be pushed across three lanes of traffic and hit a second vehicle. Airbags deploy, and the victim’s car is totaled. After the victim is pulled out of his vehicle by a bystander, he is rushed to the ER with chest pain, neck and lower back pain, as well as lacerations to his face, hands, and legs. He presents to a VA Hospital two days later with severe chest and neck/back pain and is diagnosed with rib contusions and soft-tissues injuries. He attends physical therapy for a month. The victim, however, is unable to continue his treatment regimen due to his son's being diagnosed with a rapidly progressing terminal illness. You can see why Miller & Zois took this case, right? The guy is a good man who is a war veteran and has a son who is very sick. The victim brings a claim for negligence against the at-fault driver for failing to yield the right of way. The Defendant is insured by Allstate, and although liability is not contested, Allstate refuses to provide adequate compensation for the victim, arguing that his injuries are not significant, as he only attended a month of physical therapy. The victim claims $9,772.05 in past medical expenses. Allstate offers $11,000. We agreed to file suit because the offer is ridiculous. But Allstate wants to go to arbitration instead, maybe because its record trying cases against us is not so good. The case proceeds to binding arbitration with a high-low offer ($11,000.00 low and $19,000.00 high). An arbitrator, agreed upon by the parties, listens to and considers the evidence for a week before awarding the victim $18,750.00 in compensation. 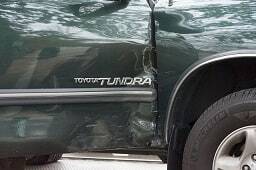 June 2013, Maryland: $56,392 Verdict: A 54-year-old landscaper was driving on Route 2 in Anne Arundel County with a friend riding in the rear seat when a vehicle driving in the opposite direction veered across the center line and struck his vehicle. His passenger was taken by ambulance to a local emergency room where she was diagnosed with soft tissue injuries in her spine and arm lacerations. The landscaper presented to the emergency room a week following the accident with back pain and headaches due to whiplash. Both received chiropractic treatments due to soft tissue injuries. They sued the driver for negligence, claiming the Defendant failed to maintain his lane of travel. The Defendant, insured by Allstate, admitted liability but argued the Plaintiffs’ injuries were pre-existing and unrelated to the accident. An Anne Arundel County jury deliberated for an hour and a half before rendering a $30,307.82 verdict for the driver and $26,083.88 for his passenger. The driver had $4,123.33 in medical bills and lost wages; the passenger had $3,041.94. June 2013, Maryland: $108,728 Verdict: A 32-year-old sales manager was driving on Nice Bridge in Charles County when she was rear-ended. She sought treatment from an orthopedic surgeon and a neurologist shortly after the accident for soft tissue injuries to her spine and headaches from whiplash. She sued the driver for failing to keep a proper lookout. The Allstate insured Defendant denied liability, claiming the accident was minor and did not cause any significant injury. A Charles County jury rendered a $108,728 verdict, which was reduced to policy limits of $100,000. The plaintiff sought $27,181.99 in past medical bills and $40,000 in future medical bills. April 2013, Maryland: $2,301,250 Verdict: A 48-year-old occupational therapist was stopped behind a turning vehicle on the way to a client’s home. While stopped she was rear-ended by a speeding truck. She was transported to a local emergency room where she was treated for a concussion and whiplash. After the accident she began to have difficulty finding her way to clients’ homes and experiencing fits of vertigo that would frequently result in falls. She sued the driver for negligence as well as his employer for vicarious liability, as the driver was operating the vehicle in the scope of his employment. Plaintiff claimed the Zurich insured Defendant failed to keep an appropriate distance between vehicles and failed to stop in time to avoid a collision. Defendants argued Plaintiff’s complaints of vertigo and headaches were pre-existing and not related to the accident. A Washington County judge - not a jury - found the Defendants negligent in their actions and rendered a $2,301,250 verdict for the Plaintiff. So, while we are calling this a whiplash case, it is really whiplash plus other injuries. We include a case like this because this is how these injuries often present. March 2013, Maryland: $10,000 Verdict: A 60-year-old unemployed woman was attempting to turn left onto Corbett Road from York Road in Baltimore County when she was rear-ended. Shortly after the accident she visited her primary care doctor and was treated for chronic headaches as a result of a whiplash injury. She also sought treatment from a neurologist and massage therapist for her headaches. She sued the driver for negligence. Plaintiff claimed the Defendant failed to stop in time and failed to keep an appropriate distance. Defendant admitted liability but argued the extent of the Plaintiff’s injuries. A Baltimore County jury found for the Plaintiff and awarded her $10,000. April 2010, Maryland: $3,679 Verdict: A school vice-principal was driving on North Avenue on her way to work. While attempting to make a left turn into the school’s parking lot, an oncoming vehicle swerved into her lane of travel and collided with the vehicle. She sought treatment for whiplash shortly after the accident. The woman sued the driver for negligence. Plaintiff claimed the Defendant failed to properly observe the surrounding traffic and was speeding. Defendant argued he had the right of way and contended Plaintiff pulled into the path of his vehicle. A Baltimore City jury rendered a $3,679 verdict for the Plaintiff. The woman had $3,679 in medical bills. Freeman MD, Rosa S, Harshfield D, Smith F, Bennett R, Centeno CJ, Kornel E, Nystrom A, Heffez D, Kohles SS. A case-control study of cerebellar tonsillar ectopia and head/neck (whiplash) trauma. Brain Injury 2010;24(7-8):988-94. Nystrom NA, Champagne LP, Freeman MD, Blix E. Surgical fasciectomy of the trapezius muscle combined with neurolysis of the spinal accessory nerve; results and long-term follow-up in 30 consecutive cases of refractory chronic whiplash syndrome. J Brachial Plexus and Peripheral Nerve Injury 2010:5;7. Siegmund GP, King DJ, Lawrence JM, Wheeler JB, Brault JR, Smith TA. Head/neck kinematic response of human subjects in low-speed rear-end collisions. Warrendale, Society of Automotive Engineers, Inc., 973341, 357-385, 1997. Szabo TJ, Welcher JB, Anderson RD, et al. Human occupant kinematic response to low-speed rear-end impacts. SAE Tech Paper Series 940532, 23-35m 1994. McConnell WE, Howard RP, Guzman HM, et al. Analysis of human test subject kinematic responses to low-velocity rear-end impacts. SAE Tech Paper Series 930889, 21-31, 1993. If you have a serious injury as the result of a whiplash accident in Maryland, you are in particular need of a good, experienced car accident lawyer that can help you present a meaningful claim for settlement or, if necessary, at trial. Again, we do not take all or even most of the soft tissue accident injury cases we review. But if we do, you can be sure our auto accident lawyers have the experience to sort through these complicated issues your case presents and stand up to the car insurance companies to fight for fair compensation. If you have suffered a soft tissue whiplash injury in a car or truck auto accident call 1-800-553-8082 or get a free on-line no obligation consultation and request more information or a phone call.